Summary: The Concept 2 Model E is a top-end rowing machine. It takes the best tech from Concept 2 – and adds a PM5 monitor on top. This rowing machine is quiet, sleek and solid – aimed at those who have decided that rowing is for them – and that they want the very best equipment. It should not come as any surprise to those who know Concept 2, that the reviews / feedback from previous buyers is glowing. The PM5 Monitoring system is designed to give you accurate, consistent measurements so you can follow your progress from row to row. Check out these, along with the impressive close-up pictures over on the dedicated amazon.co.uk product page. Indoor rowing is an effective full-body, low-impact workout. Flywheel design minimizes noise while maximizing a smooth feel. Includes the Performance Monitor 5, giving you accurate, comparable data for every row. There is no doubt you’ll be getting a beautifully made machine with the Model E. The sleek good looks are part of a bigger machine than most home rowers. Concept 2 Model E machines are approx 44cm x 61cm x 51cm. You’ll need a little more space than this to row in. While the 30kg weight is closer to commercial models than home use machines, there are wheels to move it around. This rower also folds nicely for storage. You can find pictures of it folded on the amazon.co.uk product page. Underlining the build quality is the max user weight. This is 227kgs, which is more than 35 stone. It will also work for different heights – thanks to the fully adjustable footrests and handles. This is one sturdy piece of equipment that would be at home in both a commercial setting and a home gym. Minimal assembly is required for this model. I have to mention the PM5, which acts as your training companion, monitoring your distance, speed and calories burned. It is compatible with your Mac or PC for storage of your workout data and it is Bluetooth enabled to connect to your wireless devices (phones or monitors). PM5 is the flagship technology used by Concept 2 in their commercial gym equipment models. With many monitors suffering from guesswork, the idea behind PM5 is that the measurements are both accurate and super-consistent. You’ll know exactly what progress you are making each time you row. 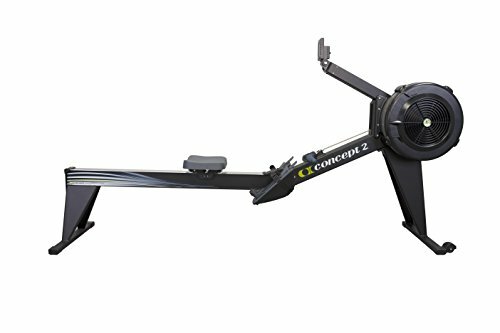 Feedback: What Previous Buyers Said About the Concept 2 Model E Rowing Machine? I like to look for themes which run through several reviews for all equipment covered here. There are two themes for this rowing machine. The word ‘excellent’ appears many times (not always the correct spelling mind…). You will also find the word ‘quality’ repeatedly. In general, overwhelming positive feedback – and surprise at the build quality, even at the higher price point. Wrapping Up: PM5 Monitoring + Quality Construction: Is the Concept 2 Model E Rowing Machine Worth the Price? It is rare to find a rowing machine which would be equally at home in a gym or a spare room! The Model E from Concept 2 comes as close as any rower I have seen to fitting both roles. It looks elegant, is big and solid and adjusts for all heights… 6’6″ and 35 stone, no problem – 5 foot 3, you’ll fit too! Including the professional standard PM5 monitor is the icing on the cake for me. You’ll get a 5 year warranty on the frame, and 2 years for the moving parts and monitor. You’ll also have the peace of mind of knowing that you have a rower by the best of the best in this category – Concept 2. Check out the impressive picture gallery, and see that feedback from previous buyers for yourself on this dedicated amazon.co.uk product page now! For many more options see this Rowing Machine Reviews main page or maybe the acclaimed JLL R200 Luxury Home Rower is the perfect model for you!